The Salzburg Ice Caves is a very fun tour, but you need to insure you have warm clothing and footwear. There is a lot of climbing of stairs during the tour, and I would highly recommend bringing a flashlight, since you only get 2 or 3 per group (I used by cell phone as a light to see where I stepped.) The natural ice formations are amazing to look at. Castle Hohenwerfen is built atop a 150 meter rock and has several steep spots that need to be “climbed” to tour the whole castle. It is a "sister" of Hohensalzburg Fortress and dates back to the 11th century. 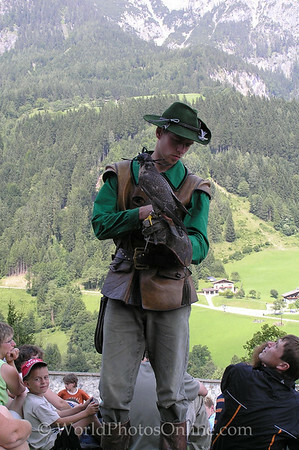 One of the key attractions of the castle is the Falconry Centre which has daily flying demonstrations by various birds of prey.